African Wildlife Foundation is excited to offer an exclusive safari to northern Tanzania during the height of the great wildebeest migration in Tanzania’s Serengeti National Park. The summer months of July and August are the ideal time to visit Tanzania, when immense migratory herds of wildebeest, zebra, and gazelle converge along the famed Mara River. This incredible spectacle, involving one to two million animals, is a sight not to be missed. In addition to Serengeti National Park, during this 12-day safari, you will explore the unspoiled landscapes of Tarangire, the Ngorongoro Crater, and AWF’s Manyara Ranch. You will see some of Africa’s most celebrated wildlife, including lion, elephant, cheetah, giraffe, rhino, and more. During the safari, you will visit AWF flagship conservation projects like Canines for Conservation, Manyara Ranch, and an AWF Classroom Africa Primary School. Whether you are spotting a leopard, learning about local culture, or sharing conservation stories around a campfire, Tanzania is the ultimate safari destination. Accompanied by an AWF Safari Leader and local naturalist guides, this is the ideal adventure. Head into Arusha to visit AWF’s exciting Canines for Conservation Program where experts train sniffer dogs to detect wildlife contraband. Then explore Tarangire National Park, best known for its large elephant herds and massive baobab trees. You will have two and a half days to explore the park, spotting giraffe, lion, and maybe the occasional leopard. Depart Tarangire for AWF’s Manyara Ranch, a 45,000-acre conservation area in the wildlife corridor connecting Lake Manyara and Tarangire National Parks. Since AWF acquired this land, eland, elephant, wildebeest, and other large mammals are again traversing the landscape. Here you will see how local communities are benefiting from wildlife conservation, including a visit to the local school. Enjoy a tour of the ranch and school with AWF staff before settling into your ecolodge set on a nearby organic farm. Spend a relaxing morning enjoying the farm and bird watching, followed by lunch. Next stop is your camp, perched high on the crater rim, where you can hear the distant jangling of Maasai cow bells. Spend the next full day exploring the crater floor where you will find hippo wallowing in shallow pools, ostrich running across the savannah, and all of Africa’s Big Five: elephant, rhino, leopard, lion, and buffalo. Leaving Ngorongoro, you will drive through famous Olduvai Gorge, where the Leakey family has made so many important archeological discoveries. Continue to drive to Serengeti National Park to where you will explore Seronera Valley’s varied eco-system, observing lion, baboon, giraffe, elephant, impala, hippo, ostrich, crocodile, warthog, and so much more. From your camp, you will not only have excellent access to wildlife, but you will also have an opportunity to take an optional hot air balloon excursion. 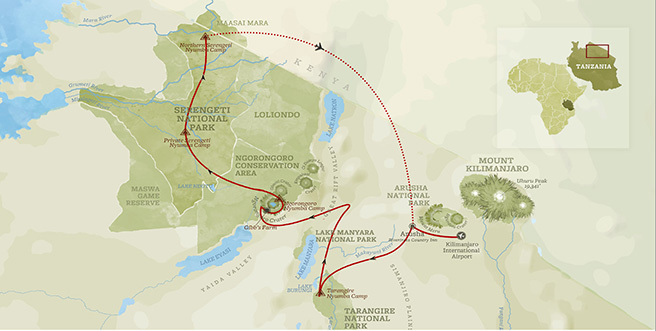 Today, you will transfer to an entirely different region of the Serengeti to gain deeper insight to the park’s wonders. The northern Serengeti is raw, wild and less-visited than other areas. This is arguably the best location for viewing vast herds of wildebeest and zebra during the dry season. Almost 2 million hooved mammals annually converge on the Mara River, and with a little luck, you have a chance at witnessing a river crossing. At the close of the day, enjoy a farewell dinner with your travel companions. After breakfast on your final day, fly back to Arusha in time for a farewell lunch at Arusha Coffee Lodge. At the adjoining Shanga Arts Center, browse through boutique Tanzanian jewelry and crafts created by disabled artisans whose training and support are funded through the Shanga Foundation. Rest and relax in your day room before your flight home.